And the rest of the year too. With Easter just around the corner why not consider a break in Devon and finish up in Plymouth and while it might be quite a long way access is very easy from most parts of the UK. By rail Great Western Railway (GWR) offers connections via Bristol; and London Paddington is just three hours by the quickest train to Plymouth itself. Bristol is again the hub when it comes to road travel but you need to get your timing right. On a good day it is a doddle at the multiple junctions but for instance on the Thursday before Good Friday (and most Friday afternoons) it is best to keep away with very heavy traffic. Try not to go back on a Sunday afternoon! The nearest airport is Exeter with services from a number of British airports (including London City) and now Norwich, also Amsterdam and Paris. Pick up a hire car and in a little over an hour of landing you can be in Plymouth, or high up on Dartmoor at a splendid hostelry. Using the Kia Picanto (see in this issue) we motored down from Edgware to The Two Bridges hotel, sitting next to the River Dart on the edge of Dartmoor National Park. The original stone bridge is still in place and used by motor vehicles for alternative access from the B3357. It sits in 60 lovely acres in a delightful setting, an oasis coming off the bleak moor. The hotel markets itself as a walking or motoring centre, conference setting or wedding venue, and there is fishing too. With 32 bedrooms it is large for this part of the world but it has a very homely feel about it, with a log fire in the lounge and bedrooms in keeping with the history of the place which dates back to around 1775. The ‘fine dining’ restaurant attracts people from Plymouth for the evening, about a 30-minute drive. Dartmoor National Park covers some 368 sq miles. It can be bleak and at the same time beautiful. 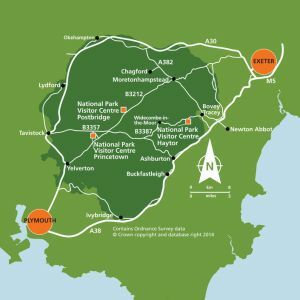 It was the fourth National Park to be designated in the UK in 1951 and has been described as a landscape shaped by millennia of human activity – water; woodlands; the patchwork of farmed fields – all set against a backdrop of breath-taking high open moorland. Dartmoor is one of the most important Bronze Age landscapes in Western Europe, containing thousands of hut circles, the remains of human habitation, religious complexes and burial sites. The longest stone row in the world can be found on Dartmoor. Dartmoor’s ponies play an important part in habitat management by grazing plants that cattle and sheep will not eat. The supervision of Dartmoor is funded as a grant via the Department for Environment, Food and Rural Affairs plus donations and local revenue. Next stop is Tavistock which is six miles away on the road to Plymouth. Under the same private ownership as the Two Bridges, the Bedford Hotel sits in the centre of the ancient town, and has much the same ambience as its sister property although in a completely different setting. It too has 32 bedrooms and a fascinating history going back 300 years, the present hotel dating from 1822. The property was owned by the Dukes of Bedford until 1955 and subsequently became part of the Trust House Forte Heritage Group. In 1999, already the owner of the Two Bridges, Philip Davies acquired the hotel and set about bringing it up to the high standard it is today, the centre of social life in Tavistock, welcoming visitors all year round and very popular for afternoon teas. There are several well-appointed reception rooms and an outstanding refectory that somehow combines ancient and modern, ideal for gathering of all types. At the rear is a walled garden just over an ornate bridge and ideal for a summertime reception. The position of the Bedford Hotel is ideal for a quiet walk around the town, the importance recognised by the granting of a Market Charter by King Henry I in 1105. Sir Francis Drake comes from these parts and was once the mayor. In 2005 Tavistock was voted 'Best Market Town' in England and in 2006 'Best Food Town', largely on the strength of the many independent food shops and suppliers in the town and the Pannier Market, roofed and the home of a multitude of stalls selling bric-a-brac and collectables. Plymouth itself is de-facto the capital of Devon and Cornwall and the largest city in the country not to have an airport. It vies with Portsmouth as the senior Royal Navy port and lies in the centre of one of the most historical parts of the country. There is plenty to see and do. 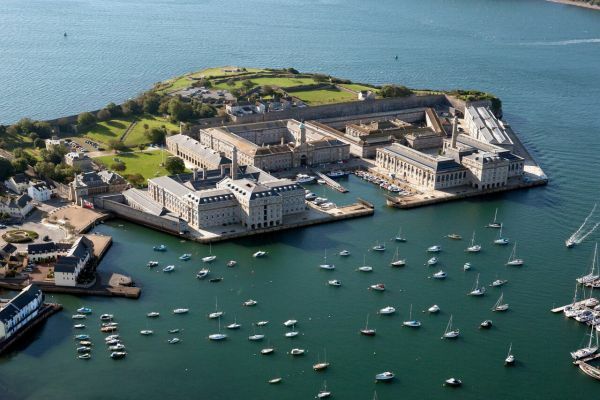 First opened as a private enterprise 10 years ago the Royal William Victualling Yard in Stonehouse, a suburb of Plymouth, was the major provisioning depot of the Royal Navy and an important adjunct of Devonport Dockyard. It was designed by the architect Sir John Rennie and was named after King William IV. It was built between 1826 and 1835, and occupies a site of approximately 16 acres. Currently it is very badly signposted from the Plymouth – Torpoint Road (A374). Drive through the archway when you get there. Parking is easy but there is no information centre although discreet maps help finding one’s way around. Cafés, bars, restaurants, museum, art galleries, offices and residential spaces have taken over what must have been a pretty rough place in navy times. Currently there are 78 apartments in what was once The Brewhouse and 52 in a building called The Clarence with a hotel now planned for the Melville, once the administration centre. As Grade I and II listed buildings, commercial tenants have to be careful in the way they display their whereabouts. No garish Prezzo, Wagamama or pub signs. The former Mills Bakery is home to a range of 88 individual accommodation units including micro, bay and corner apartments with fantastic views. These complement the existing features of Mills Bakery which includes massive granite and limestone walls, exposed timber roof beams and arched windows. Forthcoming events include the Art and Crafts Spring Fair: Saturday 16 and Sunday 17 May featuring some of the finest arts and crafts from Devon and Cornwall. This is the first Contemporary Arts and Craft Fair event to be held at the Royal William Yard and will take place on the lawn. BBC One's Antiques Roadshow returns to The Yard – Thursday 11 June filming. The Royal William Yard Good Food Market is open every first Sunday of the month with some of the best local food and drink in the South West. Delighted that you had an enjoyable visit to Devon, and to The Bedford Hotel and Two Bridges Hotel. Devon is such a great choice for either a short break away or perhaps a corporate event or "away from it all" meeting. A comfortable 3-hour trip by rail from London, or just an hour from London City Airport to Exeter!